NGK Spark Pugs | WHAT IS A “FOULED” SPARK PLUG? The NGK Standard Sparkplug is the workhorse at the heart of smooth-running engines around the world. Plug of choice in millions of vehicles. 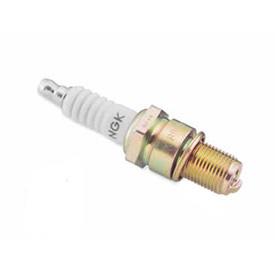 NGK is the world's largest supplier of OEM spark plugs. Tolerances are so close that the margin for error is near zero. why write a review on a spark plug. order the right one and don't jack it up installing it. nuff said. I purchased this for a spare for a Honda Ranched. Great product. Perfect fit. Good price. Would recommend. Have always used NGK plugs and never had any issues. NGK plugs have always worked great in my bike. I install a new one every couple rides and have never had a problem. You just can’t go wrong with NGK! Great plugs that last a long time ! Excellent service and excellent plugs for my 900 trail. I bought this as a spare to keep in my pack. Its a spark plug... what else can you say. Make sure and get the correct one for your bike. Great plug. Lasts long and sparks great. Best brand by far. NGK provides the best plug as usual. IMO, NGK is the crown prince of spark plugs for dirt toys. I've been using these plugs since the early 70's in my dirt bikes, street bikes, watercraft, power washer, lawnmower etc, etc, have never had an issue with them. Might as well by a hand full just in case. Anywhere from 4 stroke to 2 stroke NGK does a great job. Always puts that spark in your day !! Great Price. Plugs are awesome. Quick Delivery. I will buy again from them. Just know what plug you need and make sure the code is right for your vehicle. Gap is always perfect and they work as they should. I've never had a problem with one of these plugs. Considering how important a spark plug is, these are a good investment in quality and endurance, not seen one fail yet! good brand for stock replacement! Is there actually any other manufacturer of plug as a choice? Ngk has the market wrapped up. E3 what? I would recommend this sparkplug, and buying with RM is a great experience. I like buying high quality spark plugs and I change them often. OEM plug. This is the same plug that my bike came with. It works as expected. Great price from Rocky Mountain and fast shipping. I keep fresh plugs in all my bikes all the time so l haven't had any starting problems yet so far with them and l try to stay with what came with the bike anyways. Very good plug for the money. Never received with the order, called and informed them, lady said that she'd look into it. Got my money and no spark plug. The first plugs-the same- worked fine up to 80,000 miles. Just changed to be safe. When pulled, a nice light tan/brown colored. When the new units were installed- got 2-4 MPG better gas mileage immediately. Awesome! NGK SPARK PLUGS are far and away the best spark plugs, especially for power sports. Don't fall for the gimmick plugs, only buy the best. Industry standard setter. If your bike still has issues with a new ngk, it's not the plug. I have always use NGK's on all my bikes, no issues, fit is perfect, for me no need try nothing else. Now one thing, don't forget to check your owners manual to set the electrode gap as they don't come calibrated out of the box. Spark plugs... well worth the effort to change every year. Stick to the recommended spark plugs. NGK are one of the best stock brands out there. On my 2014 wildcat 1000X it is a little difficult to change both plugs but well worth the effort. Take your time and think things through. It can be done without removing all the shielding. Bought this for my son's 19930 Honda TRX 90. Works perfect. Easy change out. It was not readily available locally either. works superbly in my 2003 POLARIS PREDATOR 500. I bought extras, but don't know if I'll ever need them! Great plug for the price. I use them all the time. It's a spark plug. I always use NGK and I have plugs last for years. I ordered this for my rancher, BKR5E, but my manual says to use BKR5E-11... Does anyone know what the difference is? BEST ANSWER: The 11 references a "wide gap" preset which should be .044". I'm not sure but it might be the treads are different or how hot a spark the plug makes or the overall size of the plug. If it will tread into the head easily it will probably work and be careful not to cross tread the plug. make sure you compare the old plug and the new one to see if you see any visible differences. Its the gap of the electrode. Should be able to grab a gapping quarter tool from Oreillys and regap it yourself. If you have to order one stick with what it calls for. The difference is the gap. WHAT SIZE IS THe spark plug socket? BEST ANSWER: If its a 2 stroke it will most likely be a 3/4 size socket and 4 stroke will be a 5/8 socket. BEST ANSWER: Works for my KTM 200 plugs. The elctro-flow of a 2-stroke is radically different than that of a 4-stroke. Therefore the polarity of this holder would be reversed and the imposition of a 2-stroke plug into the cavity of the 4-stroke plug holder might cause a catastrophic event, resulting in great damage to body and machine. That being said, why not? I wear a fanny pack with tools etc so i have what I need when I need it. An extra plug wont be any good without tools. It wont take up much room in a fanny pack and it will definitely protect the spare plug. 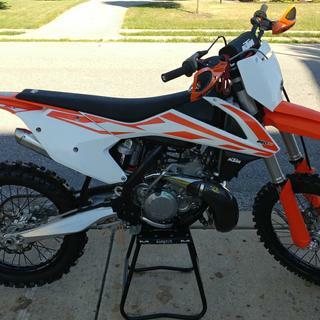 I have a 2016 Husky TE300, same motor as the KTM that year and I have had had NO problem with 5his plug holder and think it is a good design. what is the gap for this spark plug? BEST ANSWER: The gap isn't determined by the spark plug, but by the machine it is going into. Check the service or owners manual for your bike and that will give you the correct gap specification. Rule of thum- .034 , just a hint-- allways run an extended tip not a shrowded tip. Way better spark to fuel. Due to fouling plugs more often then normal, besides adjusting my reed valves. I think I need to change from a BR8ECM to a hotter temp spark plug. Any suggestions to what other plug would work for a 14 250 sx? BEST ANSWER: If this is a new problem and you haven't changed anything on the bike you might have wore out the crankcase seals witch causes the motor to burn gear oil fowling out the plug. It seems to be a common problem on these bikes and is a easy fix. Using a hotter plug is not a good idea. There's a reason you're fouling plugs. Check your clutch side oil seal as this is a common cause of fouling. A hotter plug can cause damage to the piston with extended use. May be time for a top end rebuild as well. If your bike has over 40 hours or more on the piston, it should be about time. Fouling can be caused by many issues. Try a jetting site like JD Jetting to see where you're at. The best way to check the health of a 2 stroke is a leak down test. What size helicoil would I use for the cr8e plug? BEST ANSWER: 10x1 mm with a finished length of 15 mm.